Thank you messages for wife: Everyone keeps waiting for special days like birthdays, anniversaries and Valentine’s Day to say sweet things to their partners. If you think that your love is way more precious than just another cheesy card message on one day in the full year, surprise your wife by leaving a cute thank you note in her wardrobe. She will feel like the happiest woman on the earth to know how much her husband appreciates all the hard work she puts into the family and her own professional space. Whether it is something funny or something deeply touching – write something that makes her heart skip a beat. It is a great way to show gratitude while keeping your marriage ever so romantic. 1) You are not just my partner, you are my lover. You are not just my companion, you are my inspiration. You are not just my wife, you are my life. Thanks for everything, you give me wings. 2) If there was a number higher than zillion, bazillion or gazillion, I would thank you that many number of times for everything you have done for me. I love you. 3) You made me dream, when I simply saw. You made me execute, when I simply thought. You made me listen, when I simply heard. You made me live every moment, when I simply existed. Thank you. 4) Thanks for having answers to all my questions, remedies to all my ailments and solutions to all my problems. I love you. 5) A song, sonnet, limerick, ballad, couplet, verse or ode – no form of poetry has the capacity to express what you mean to me. Thanks sweetheart. 6) I gave you my house, you made it a home. I gave you my heart, you made it your abode. I gave you my soul, you made it your own. Thanks for everything. 7) I cannot rank you as a wife because no rate card in this world has numbers going up to infinity. Thanks for being the best. 8) Thank God every man doesn’t have a wife like you or else every man would claim to be the happiest in the world. Thanks wifey. 9) You help me to regain hope after despair, resume life after obstructions, restart journeys after detours, revive strength after defeat and resurrect dreams after rejection. Thank you. 10) In the walk of fame of my life, you are the only star. Thank you sweetheart. 11) No scientist has ever discovered the formula for a successful marriage like I have. No adventurer has ever been on an exciting adventure of love like I have. No explorer has gone in the depths of a relationship like I have – all because of you. Thanks. 12) If you were my business partner, we’d be millionaires. If you were my gaming partner, we’d win all the tournaments. If you were my gym partner, we’d be the hot bods in town. 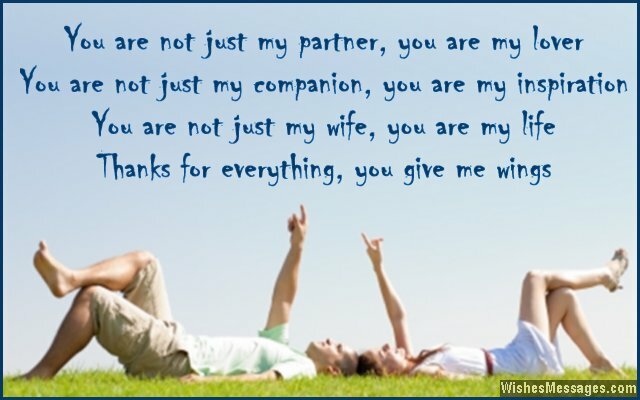 But since you are my life partner, I have all these things and much more. Thanks. 13) You are the best thing that happened to me. You are the best thing that is still happening to me and you are going to be the best thing to happen to me, ever. Thank you. 14) You have never made me feel like your Mr. Right. You have always made me feel like your Mr. Perfect. Thanks honey. 15) Thanks to a wonderful wife like you, my moods have never seen the color blue. 16) I don’t want to win the race of life by being the fastest runner. I want to win it by walking slowly, hand in hand with you. Thanks for everything. 17) A woman like you could have got any man she wanted. But a man like me could only dream of getting a woman like you. Thanks for making my dreams come true. 18) The reason my eyes haven’t been able to shed a single tear since our marriage is because they have been too busy ogling at you, my beautiful wife. Thanks for taking my breath away even after all these years. 19) You are the electricity that keeps me charged, sunshine that keeps me awake and food that keeps alive. Thanks. 20) Most husbands get bogged down by marriage with chains, but I got a flight with a pair of wings. Thank you darling. 21) You are the reason I wake up way too early in the morning and sleep way too late at night – for I am busy looking at your lovely face when the sun shines and thanking God for giving me a wife like you when the night envelops our lives. 22) All my actions, decisions, battles, thoughts, plans and dreams lead to only one destination – you. Thanks baby. 23) My dear wife, thanks for being the only support I have ever had and I will ever be needing. 24) Like black and white, yin and yang, cold and heat, rough and smooth, we are opposites that balance each other. Thanks for being my perfect better half. 25) I made all the right choices in life because I had the right person to help me make them. Thanks for being there. 26) The woman who is a perfect homemaker, lovely mother, successful manager and the best wife is not a myth, it’s YOU. Thanks for everything. 27) Men who make their girlfriends their wives think they have the best of both worlds. But I made my best friend my girlfriend who later became my wife which means I have the best of all the galaxies. Thanks dear. 28) Thanks for being my leash when I was running too fast and my push when I was moving too slow. Thanks for being my anchor when I was sinking too deep and my rope when I was flying too high. 29) Superglue might work at fixing broken stuff around the house but only one thing is strong enough to hold my life together – YOU. Thanks for everything. 30) Just like how water is to fire, your reassuring words have put out the flames of frustration in my life. Just like how fuel is to fire, your support has lit up the flames of success in my life. Thank you for everything. 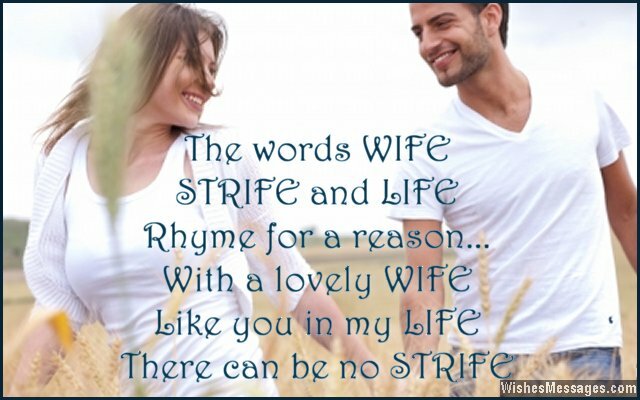 31) The words WIFE, STRIFE and LIFE rhyme for a reason – With a lovely WIFE like you in my LIFE, there can be no STRIFE. Thank you. 32) My dear wife, thank you for being the guiding light when life threw me in the darkest of corners. 33) Thanks for never changing me, but only changing the way I think. Thanks for never rejecting me, but only rejecting my mistakes. Thanks for never doubting me, but only doubting my weaknesses. 34) You are the kind of amazing wife that every girlfriend should eventually become. Thank you. 35) Today is not Valentine’s Day. Today is not your birthday. Today is not our anniversary. Today is just another ordinary day when I am feeling thankful for having a wife as special as you. Thanks for making every day of our lives a grand celebration.